Rates for this unit are based on two occupants, (additional $10/night/person), and also vary depending on season and length of stay. Please specify your desired dates and number of occupants on the "Rates & Availability" tab to obtain a quote for your specific circumstances. Older condo on beach next to park. Good staff work hard to maintain. Nice combination of older couples and families. Can be noisy. Wonderful place! And both great beach and park next to it! Wonderful for a two years old! Loving the park views at the Hale Kai! I love this unit for the view of the park and the ocean. It was very relaxing stay. The unit could use a little updating, but it was clean and comfortable. I liked the option of the pool when the ocean was too rough. I'd stay here again. Hale Kai was a wonderful place for a relaxing get away to a small community that is perched right on the ocean. The condos have marvelous views of the /beachocean and a peak into the private life of Hawaian families with a well used park next door. Seeing the sea turtles in the morning and evening just feet away from our lanai and front door was an added bonus. Our condo 103 is greatly in need of refurbishing, but the location was wonderful. We would return again in the future, but would select another condo (unless this one is updated) on the first floor. Quiet, restful, fun. helpful. She quickly replaced a lightbulb and nonfunctioning blender. Hale Kai is th perfect spot for a relaxed getaway. The surf sounds lull you to sleep at night and the sand is just steps from your door in the morning. The management couldn't be more friendly or accommodating and fellow guests are a varied and delightful group. We have stayed in #103 twice and find it homey and welcoming. We hope to return in 2019! Nice little gem of a place. This is the fourth time I have stayed at Hale Kai. #103 has a beautiful view of the park and beach. TV needs to be upgraded, and we had to buy an HDMI cord for it to work properly. Can't spend every second in the beautiful outdoors otw it's centrally located, enjoyed the market and early morning walks on the beach. 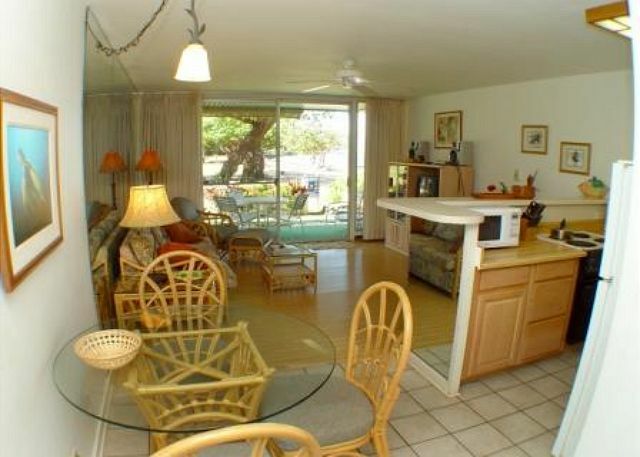 The location is nice and the lanai has a wonderful feel and view. The condo, however, needs upkeep. The bedroom door has a gaping hole at the bottom - a few inches have been rotted or chipped away from the door. The fridge has dark stains up and down the side facing the counter top and stove. These things detract from the experience. A conscientious owner would have fixed them. The complex is older, but not all units are like this; relatives stayed in an upstairs condo and it was by comparison immaculate. We did enjoy our stay there, but the condition of the unit was disappointing. Enjoyed our stay, nice location and view from lanai. Condo was economical but sub-par for cleanliness and upkeep. For example, the refrigerator had dark stains on the side facing the counter top. This could and should have been cleaned. The bedroom door is falling apart on the bottom. It has disintegrated to the degree that there is a gaping, jagged open space where the door should come near the floor. The condos are older, but others are much more presentable. A family member rented the unit upstairs, and it was by comparison immaculate. All said, we did not regret the stay there, but much could be done to care better for the property. We enjoyed being on a beach with relatively mellow waves adjacent to a park with a playground. The area has a mellow, non-commercial atmosphere. We stayed in #103 for 8 nights. Some of the islands best beaches. Would blow into our condo. We love everything about Hale Kai, we would move there and live forever if given the option. The location is perfect, there is the beach park, a private beach and the pool. We barely left the grounds, we had a bomb coffee shop, farmers market and the fresh fish market down the block. What else do you need!!??? If you are looking to find the meaning of Aloha, the condominiums at Hale Kai are a great place to start. Intimate 40 units, close to beach, nice pool. Many guests are annual visitors and welcome you into their circle. Older units, many updated. Attentive management. Great place to relax. We chose to stay at Hale Kai after my several weeks of searching for the perfect place to stay for our first family trip to Maui. I had wanted to be able to walk right out my door to see and hear the ocean and beach without having to cross the street. We also wanted a safe place for our children to play in the water. We have a 2 year old and a 6 year old. Hale Kai turned out to be the best decision ever! Not only could be see and hear the ocean-it was literally right out our door!!!! Also, the public park(Honokowai) was so great with its protective coral reef that made it easy for the kids to wade without being taken out with the big waves. We saw tons of turtles and whales! Awesome! We also felt extremely welcomed by all the people who stayed at Hale Kai. Residents were very fun and entertaining and super kind. Lots of fun blowing the conch shell every evening at sunset. Our 6 year old just had to go and buy her own shell to join the Conch Blowers group! Very Fun! Hale Kai is also right across the street from Badass Coffee Roasters and the Farmers Market. Very handy for excellent breakfast goodies and fresh fruit...can't say enough about the fresh Papaya. Also, right up the street is the Fish Market. I am missing that Poke! We had thought at first that it might be too far away from many of the attractions that we would want to see, but actually it turned out that all we really needed was right there at Hale Kai!!! Sand, Sun, good food, good people and lots of ALOHA!!! We will be back!!!! 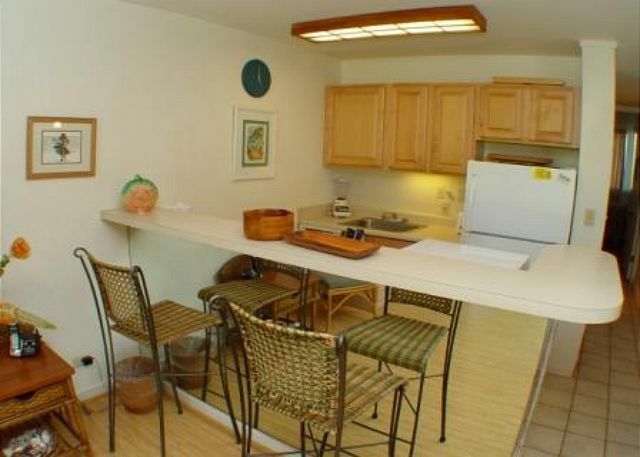 We loved our stay in Maui and would definitely stay in this location again, maybe just not in this specific condo. The location was very convenient with shops, supermarkets and farmers market all within easy walking distance. The view from our lanai(especially the sunset and the whales) was amazing. The beach area was adequate. We were able to swim in the ocean, but you had to be careful of the rocks. Swimming pool was a bit small but it served its purpose. We used the grills several times instead of going out to dinner and we also used the laundry facilities. I would recommend one of the more updated condos over the one that we stayed in. Ours was clean, but we did have small ants in the kitchen and inside the cupboards so we kept all of our food in the fridge even if it didn't need to be kept cold. The bedroom/bedding especially could use some updating and some rugs at entry ways would help catch some of the sand that so easily gets tracked in. Overall, we were happy. We had friends staying in 3 of the other condos on the property so it was great to be able to be in close proximity of each other. Nice location and right on the ocean, ideal location for family with kids. We loved staying at Hale Kai, the management couldn't be friendlier, the condos were clean and well maintained and we were in the perfect location, beach was right outside our door with water perfect for snorkeling and fishing. Right next to farmers market, shops and restaurants and a park for the kids... We couldn't be happier and would choose Hale Kai again. A room with a beautiful ocean view. We had a wonderful 2 week vacation. We could walk out the front door to the pool or out the back door and be on the beach. The property description was correct. The unit was clean and comfortable. It does need some paint through out the condominium and some miner repairs including the bedroom door and ceiling near the drapes. The manager helped us with our needs providing great customer service. The landscaping was beautifully maintained. We have and will continue to recommend the Hale Kai to our friends. We had a very nice time. That is what my 4 year old calls Hale Kai, her 2nd home!!! We love this place. the location is great and the amenities are perfect. We love the park and pool, the beaches on either side are great for swimming snorkeling and turtle watching. The badass coffee shop is a bonus along with the farmers market that is every other day across the street. Property and location are great. The oceanfront and intimate size, plus lovely pool make this spot pretty unbeatable. Quiet at night. Guests friendly. This unit needs paint and a serious update to the bathroom, but all is functional. Worth the current price. Bowls for kitchen were in short supply , only two. Kitchen needs to be repainted. Hale Kai was fantastic and so affordable! From our lanai we could see, hear, and smell the ocean! Condo had all amenities except a pair of scissors! Yes, the condos are older, but we were so happy we weren't in a place with 10 buildings, each 5 stories tall. We saw turtles at the rocks in front of the pool before noon on our first day! Saved money by cooking our own meals. Feel asleep to the sound of the waves! Clean and sufficient for this family of 4: parents and 17&21 yr. old kids. Landscaping was immaculate. Flowers in bloom - bananas near parking lot. Close to Farmer's market, snorkle rental, and coffee! Just lovely! Great location. Parking was never a problem. View from condo was fantastic, with a park adjacent to the property. Friendly, informed staff. Stores and eating establishment nearby, many within walking distance. Just a great place to spend a week or more. Location of Hale Kai #103 is the best! The ocean view is just breathtaking, right from the lanai (porch). It's located in a calm locality, right by a public park (not noisy though). All the amenities provided were good enough for our 8-day long stay. Surprise was that they even had some beach stuff - chairs, hat, umbrella , mats, snorkel etc. - which we did not have to buy or rent separately. Kitchenware looked pretty new. Onsite laundry is very helpful. Overall it was a wonderful stay, and I am sure we will go back!! Great location, beautiful pool beach. 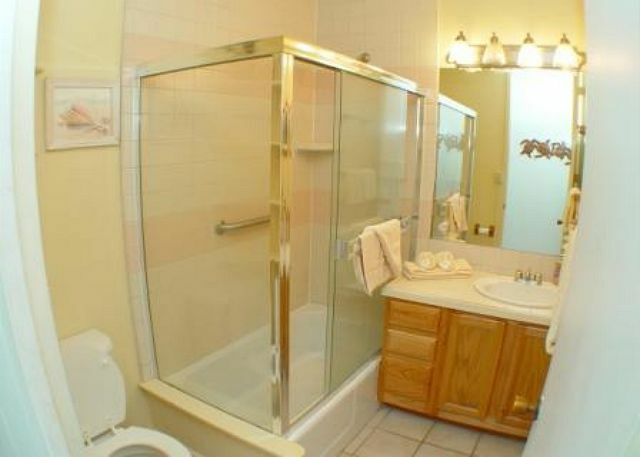 Condo is equipped with great amenities. We love coming to Hale Kai, this has been our third time. The location is perfect for us. We have a 4 year old so the park, the beach and the pool are nice to have. There's a farmers market and a bomb coffee shop right in your back yard. We love it!! The amenities need a little updating but other then that we can't wait to come back. Great place for a family reunion. We had a total of 4 units and had a great time. Valerie in the front office is a pleasure and the location could not be better. We love the Hale Kai. A real vacation! We've been visiting the Hale Kai for at least 15 years. No doubt we will return. Aloha!!!! This was our 2nd time staying here and we absolutely love this place. The location is so perfect!! Its surroundings are peaceful and beautiful. We love the Hale Kai and especially ground units next to the park where we can stroll a few steps to the beach and have morning coffee while watching the whales. This unit has a perfect location with fabulous view. The unit could be a bit better with a couple of throw rugs in the bedroom and living room. Also some better plastic ware for out at the pool. The very large stereo/radio doesn't work and the kitchen clock doesn't work, but all in all a great lace to stay. Loved unit 103 could sit on the couch and watch the Wales . Because the public beach park was right outside our Lani door. The pool was beautiful and very inviting. The condos private beach was clean and lovely. Our condo was perfect and the grounds were pristine. The only thing that could be improved would be assigned parking spaces. Sometimes when we arrived back late we had to park in the farther parking area. Not more than a few feet further, probably needed the exercise anyway. Loved the convince of the condos, Bad *** coffee right across the street, Avery nice health food store . Even a drop in emergency clinic and a large shopping area with a reasonable suppermarket. Several Excellant places to eat. The Health food store had an Excellant salad bar and serve yourself take out. I would definitely stay there again. 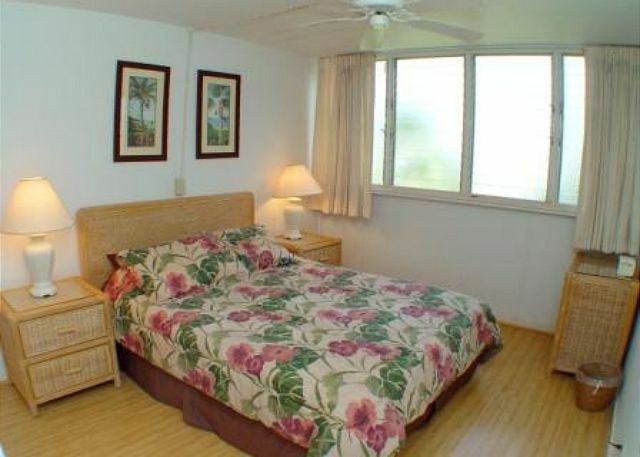 We have stayed at Hale Kai for several years and always have a pleasant vacation. We again had a wonderful stay at Hale Kai. The additions of a comfortable couch and well- functioning showerhead were much appreciated. 103 is slowly coming closer to being on par with the units around it. Perhaps painting the bathroom could be next on the "to do" list. The location is awesome, everyone friendly and the whales and turtles the added bonus to sitting on the lanai at 103. James F from Arleta, Ca does not recommend this vacation rental. We were in Maui Nov 2013 and loved our stay at Hale Kai 103, we returned this year with our 24 year old. I decided to rent 104 as well as 103 as our 24 year old is 6'4 and would not be comfortable on the hide a bed. I love the fact that 103 is situated right by the beach, perfect. The only thing it is in severe need of updating especially after comparing it to 104.The condo needs a lot of TLC, especially in the bathroom, maybe some fresh paint would help immensely. It looks dirty again with a fresh coat of paint would make it look cleaner. I feel for the same $ I can rent a nicer place so from now on will be staying either in 101, 102 and or 104. We have stayed at the Hale Kai 15 or 16 times, and we always enjoy our stay. We always have a great time when we vacation in Maui. Staying at the Hale Kai gives us comfort and location, location, location. It is right on the ocean with views to die for. We love watching the family activities at the park next door which gives us a more local feel rather than just seeing other tourists. Our unit was comfortable and clean and the office staff as always are helpful and friendly. We haven't been back to the Halle Kai for 9 years. Once we were there we felt home again. How could we forget how much we love the Hale Kai. It's very homey and relaxed. It's part of the Maui experience along with the Farmer's Market and Bad *** Coffee. 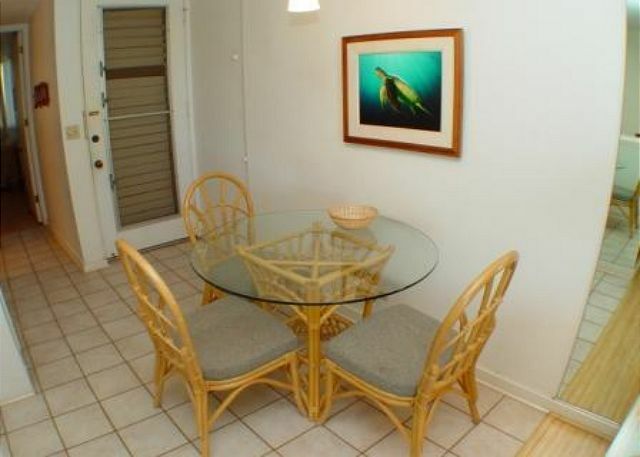 Not to mention the close proximity to Airport Beach, Kapalua Bay, Flemming Beach, Napili Bay and Olivine Pools. Several Turtles beached on the sand at the Hale Kai and the Park side. Plenty to see in the water too. We have stayed in 101, 102 and now 103. All are wonderful. We highly recommend the Hale Kai and can't wait to return in the near future. Good renters. Felt right at home. Property staff very helpful. 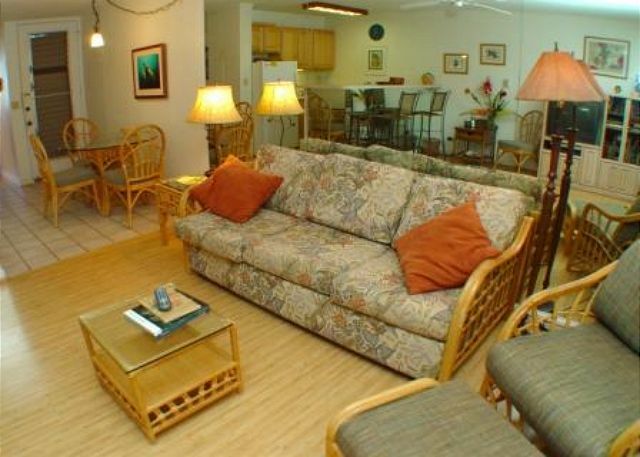 We have stayed at Hale Kai several times and enjoy our stays very much. We really had a wonderful time!! The location was perfect, the space was nice. Jean-Paul C from Fanny Bay, BC does not recommend this vacation rental. My husband and I stayed at the Hale Kai for 1 week in late November 2013. The reservation process was seamless and upon arrival easily made our way into the unit using the lock box system. Our arrival was late evening and in the morning we were very surprised at the state of our unit. We found large amounts of hair, dust and bugs under the bed, hair in the shower stall and the floor had not been cleaned properly either. Minimum amount of cleaning done in the kitchen, cupboards full of old food which should have been removed. The furniture is old and tired, the stove is probably the original one bought for the unit in the 1960's. And the unit needs a good painting. We did speak to the property manager about the amount of hair and dirt in the bedroom so the cleaners came in and cleaned the floor but only under the bed leaving other areas in the room untouched. We were never asked if we were happy with the cleanup, no follow up. Note: some appliance upgrades have been made in the kitchen. The other issued staying at the Hale Kai was the proximity to the public park; there were numerous pit bull dogs with aggressive owners frequenting the park and staying most of the day, they would set up on the beach. We saw many dog fights, dog owners fighting and local thugs brought in to beat up a certain undesirable dog owner. We lost count of the number of times the police were called. The people staying at the resort were the ones calling the police. Certainly did not feel safe being on the beach and would certainly not want to have children around people who can not control their dogs. Maui has a dog law for public parks, they are to be on leashes but it is never enforced. This resort does have a good beach location and this seems to be what keeps people coming back. Given the state of the unit we stayed in, the lack of management of the unit and the continuing issue of dog fights, we certainly would not recommend the unit. WE enjoyed our stay in Rm 103..very close to the ocean (literally 10 steps) and close to all you would want to do in Maui. We are definitely coming back and to the same room! 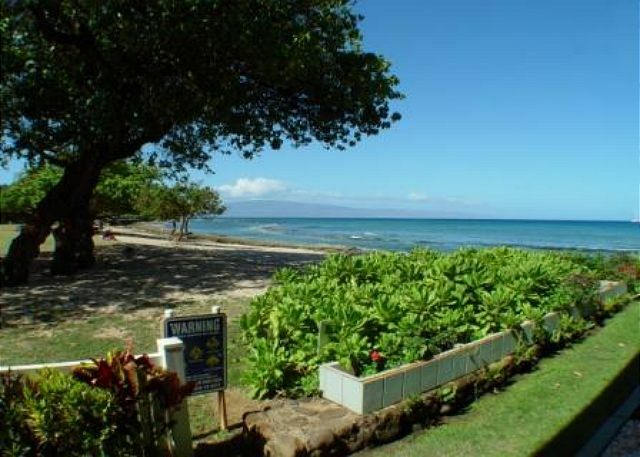 Great as always, excellent location, fantastic spots for about anything Maui can offer, snorkeling, turtle watching, surf beach not far away, sunset in front of our terrace every day in august, 15 minutes drive to Lahaina. Location, location, location!! The Hale Kai is a great location and my family (and now their families & my grandchildren) have been coming to the Hale Kai since 1967. We have always had a superlative time - until this year. The unit was dirty, the furniture was dingy, the kitchen lacks quite a bit (like a working dishwasher); the microwave is rusty and it takes ten minutes to make toast in the toaster oven (no toaster either); the oven is so old you can't read the dial. We stay in condos for a reason - to save money on food and do the majority of cooking ourselves. Thank goodness my daughter brought her own knives! A new coat of paint would help a bit. The bathroom needs an upgrade, as does the kitchen. The king size comfortable bed and the art work was appreciated. The unit just seems to be unloved I think; all of the other units we have stayed in seem to be loved by their owners. When the refrigerator died (it was near death when we checked in and it took overnight to make 7 ice cubes...management had a new fridge in within 24 hours (alas, no ice maker but that isn't a big deal). The management was good, friendly and responded quickly to problems - which unfortunately happened. I forgot to mention that the sliding screen door was very difficult to operate, once we reported it, it was fixed the next day. 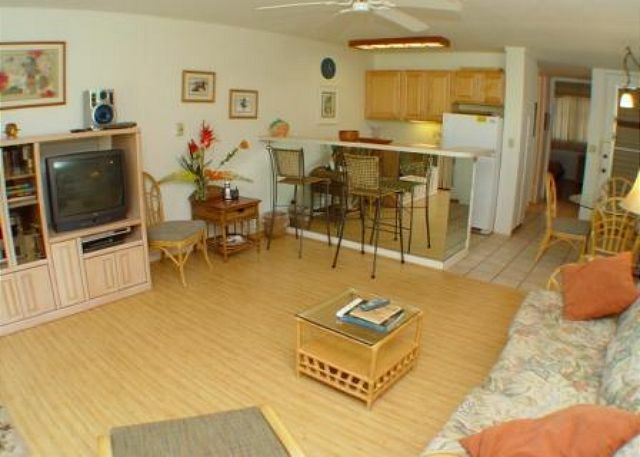 We will be back to the Hale Kai, but not in this unit unless it is refurbished. Left a list of needs (new bed, better sheets, few kitchen items) with office. Understand bed has been ordered. Location is great but unit #103 needs a bit of refreshing (fewer wine glasses, more cooking pots & bowels) to be up the standards of the rest of the Hale Kai. Rented this unit for my daughter. They loved it. We were upstairs in #203 and I rented this unit for my daughter (what a nice mom). They loved it. Every morning I looked down on the beach and they were enjoying coffee, in the very comfortable provided beach chairs, watching whales. I was a bit jealous of their easy beach access. This unit was bright and airy and perfect. The bed needs to be replaced. It is soft and sags badly. The four stars for condition is because of the bed. Very nice place to stay. A bit pricy but so is everything else in Hawaii. Great place to snorkel right off the beach with many fish and sea turtles. Great convenience of stores to buy food so as to use the onsite BBQ which was very nice to have. Condo was stocked with everything we needed but bigger skillets which we borrowed from a friend that was staying in 104. The only complaint we have is that the floor was not scrubbed or mopped prior to us moving in. Our bare feet would get black from walking around on it every night, had to wear surf shoes. This was our 2nd stay a Hale Kai. Unit #103 was fantastic! Our lanai was just a few steps from the beach. The staff was wonderful and the property was well maintained. The kids loved the pool and huge park.